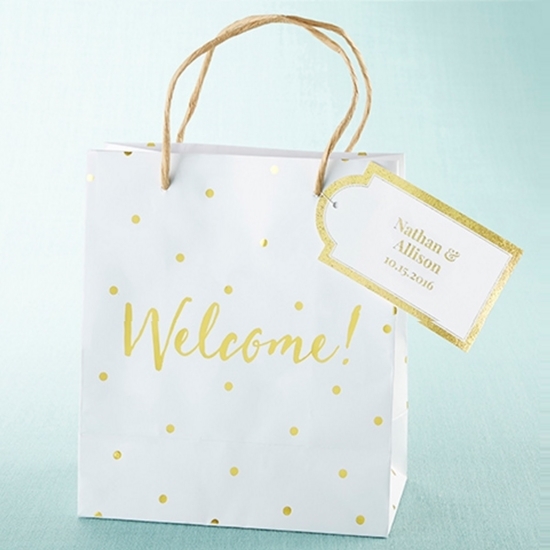 This celebration gift features a white paper welcome bag with gold foil dots and the word 'Welcome!' displayed on the center. It is sold in sets of 12 and measures 7.9' w x 9' h x 4.1' d. (tag not included). These welcome bags are adorned with golden polka dots for a cute look that captures the heart of the event. Prepare gifts of various sizes for your guests as appreciation for their support. Because of the size, the bag is not limited to all things tiny. Fill it with candles, a letter, a photo-set, or even candy. Sprinkle some colorful confetti for a nice added touch of surprise.